Farley was found beside a dumpster on the day the author Farley Mowat died, which was how he got his name. 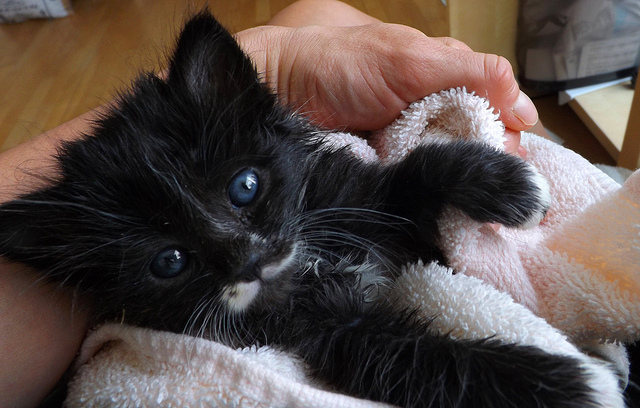 The little orphan was picked up by Vancouver Orphan Kitten Rescue Association (VOKRA) volunteers and placed in care with a litter of four other kittens so that he’d have company. The other kittens were orphaned because their mother’s owner was an idiot. He didn’t bother to spay his cat but he didn’t want her kittens either, so when he decided to move house, he brought the kittens, which were only a couple of weeks old, to a shelter and asked to have them killed. Fortunately, the shelter sent them on to VOKRA, where they were bottle-fed and cared for until old enough to be weaned onto solid food, after which they came to us for fostering. We were both busy with work at the time and had originally planned to take on just two and let the other three go to another foster home. 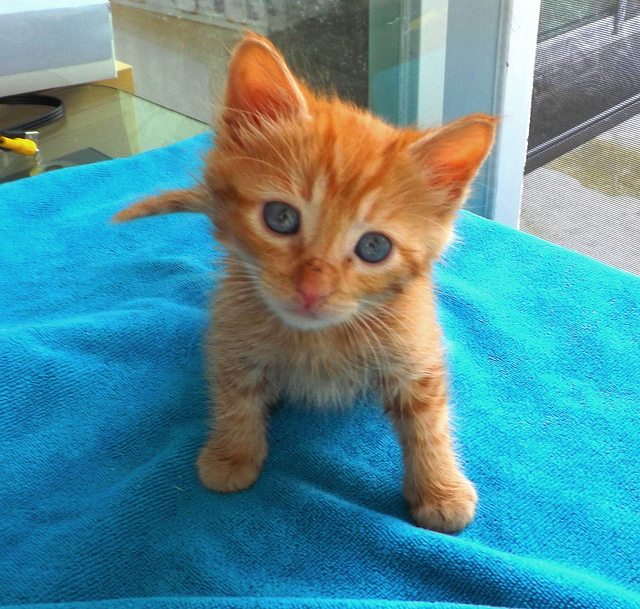 VOKRA was overrun with kittens and the volunteer who was caring for them didn’t have much time to devote to them. 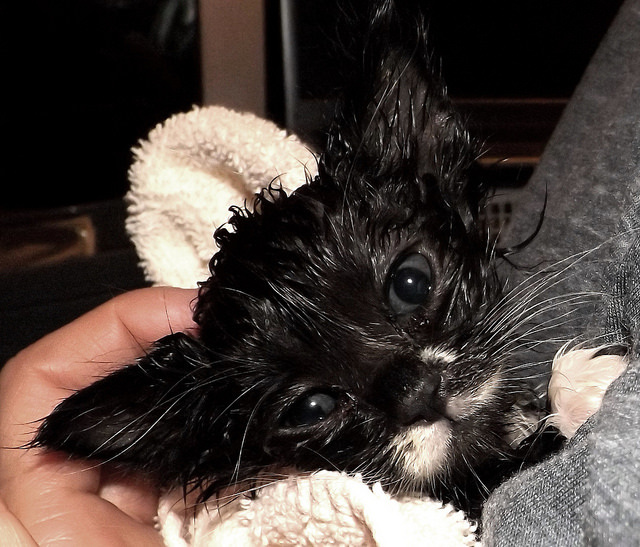 The five kittens were staying in a bathtub because they were still very young and messy. When the kittens saw us, they all began screaming for attention and climbing up our arms when we put our hands within reach. We spent a bit of time with them and then removed two from the tub. Although kittens often get upset when stuffed inside a travel container, the ones in the carrier were calm and happy, whereas those remaining in the bathtub were shrieking with an even greater hysteria than before, as though they understood that they were being left behind. Being so young, they were desperate for touch and attention, and determined not to let us get away. Somehow, those three tiny kittens managed to jump three feet into the air and cling to my sleeves like burrs, holding on for dear life, howling the whole time. I couldn’t leave them behind, so I stuffed the other three into the carrier as well and they all calmed down and accepted the journey cheerfully. When we brought them home, Farley was only about 5 weeks old and the others were about 6. Kittens shouldn’t be taken from their mothers before 8 weeks of age (and ideally should stay with their mothers and siblings for 12 weeks before being adopted out) because early separation can lead to psychological and physical problems. 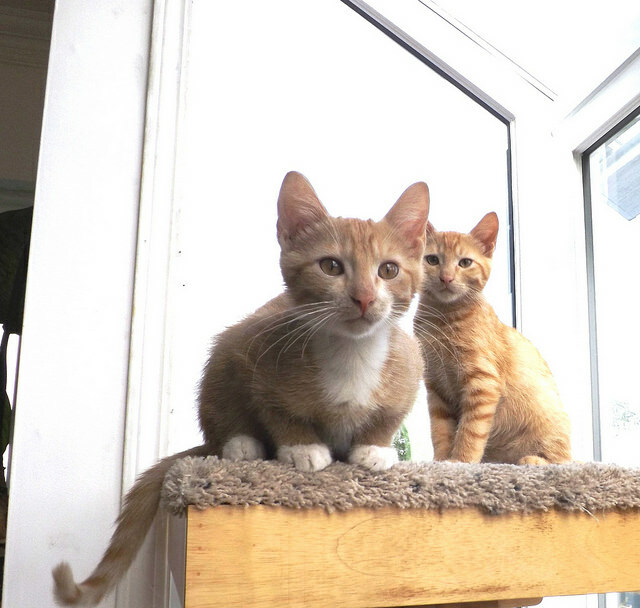 We were lucky with these kittens – no psychological problems, most likely because they had the company of their littermates and had not been subjected to any major stressors. The physical problems weren’t too bad either – some digestive upsets and diarrhea initially, but we were able to treat them by adding a little pumpkin to their food (for information about this remedy, see Using Pumpkin to Treat Diarrhea and Constipation in Cats and Dogs). Farley was the filthiest kitten we’d ever seen. We had to bathe him on the first night and periodically thereafter. 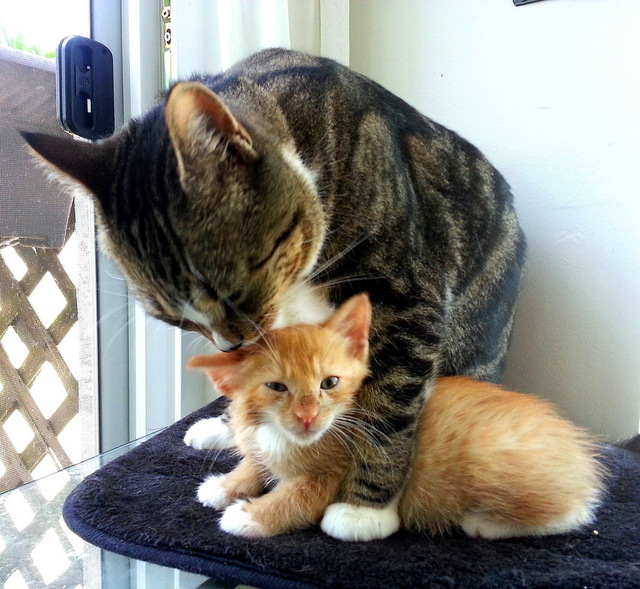 Kittens that leave their mothers too early often don’t learn good grooming habits, and Farley had long fur, which made the situation worse. The others required one bath each, but we were able to clean them up with dampened facecloths thereafter. Because they were so young, all five were also very messy with their kitten cage (where we kept them until they were mature enough to have a run of the office unsupervised) and only partially litter trained (there were a few accidents initially). These are all common problems with kittens that are taken from their mothers too soon. The kittens’ grooming habits slowly improved. They hated being washed, so they learned how to clean themselves to avoid the facecloth treatment. Our resident cats also helped with the cleanup, and the kittens were much happier to get washes from them because a cat’s tongue feels more natural than a facecloth. Also, the barbs on a cat’s tongue are better suited to removing meat encrusted in whisker pads, so they were able to do a more thorough job, and watching our adult cats groom themselves helped the kittens learn how to do it properly. The kittens all loved people because they had been raised by humans, but they had poor feline etiquette due to lack of experience with adult cats. 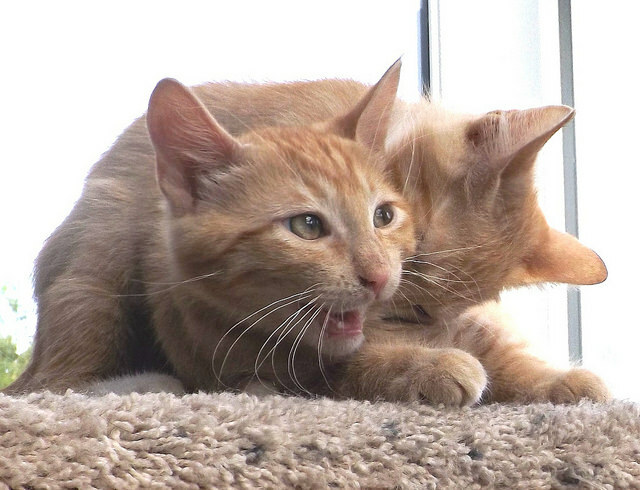 Most kittens understand that when an adult cat growls or hisses, they should stay still or back off. 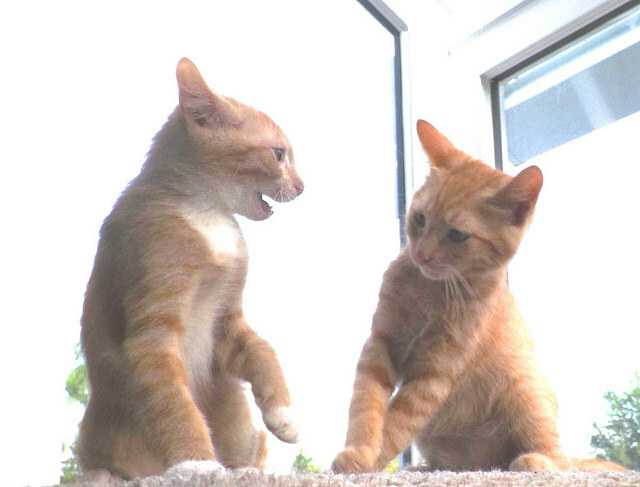 Our resident cats get to know new kittens by smell, and they usually give a little growl or hiss initially, which tells the kittens to be still and allow an inspection. On hearing the growl, kittens normally freeze and allow themselves to be sniffed, after which the bonding can begin. However, these guys really didn’t have a clue. Smokey or Freya would growl and the kittens would just jump on their heads or bite their tails – very poor feline etiquette. Our resident adults are far too nice to take a real swipe, so the kittens never really learned how to behave themselves around adult cats. Unsurprisingly, our cats took longer than usual to bond with these new arrivals, though they eventually fell into their foster parenting roles and helped us with the kitten clean-up duties. Farley was a hilarious little round puffball with brilliant comedic timing and a laid back temperament. 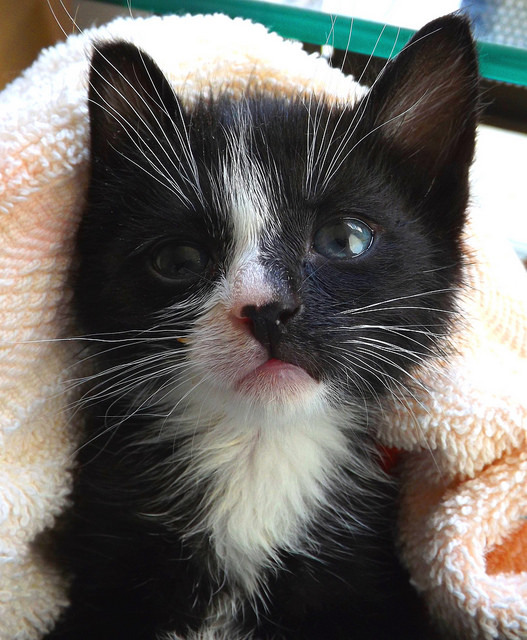 He was adopted early on by a couple who had experience with very young kittens and didn’t mind cleaning him up for awhile until he learned better habits. He is now a companion for their resident Ragdoll cat. 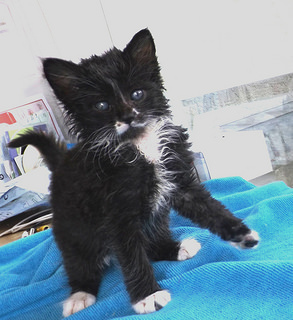 After Farley left, we continued to care for the four siblings, which included two tuxedo kittens (Tyler and Zephyr) and two gingers (TJ and Orlando). 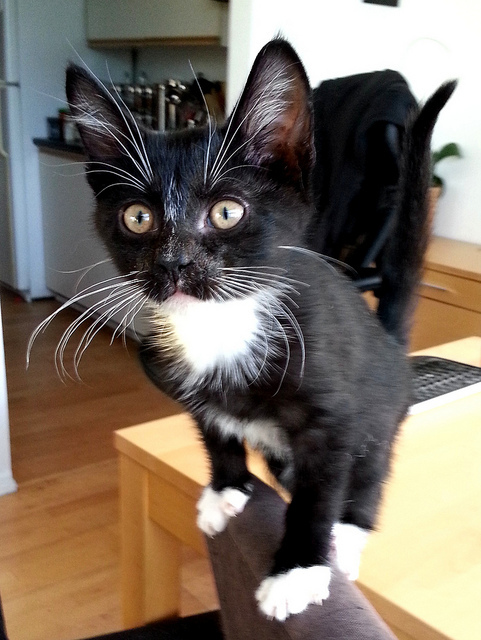 Tyler was a bold, highly intelligent kitten with a Siamese-shaped face and an asymmetrical nose blaze. He was the first to figure things out and learn the house rules, and was also an empathy kitten (the sort of cat who will show concern if you’re sick or stressed out). Zephyr was a sweet little guy with attractive markings and a charming little signature move: if you held a hand out to him and asked him to “ride the elevator,” he would wrap his limbs around your forearm so that you could lift him up. 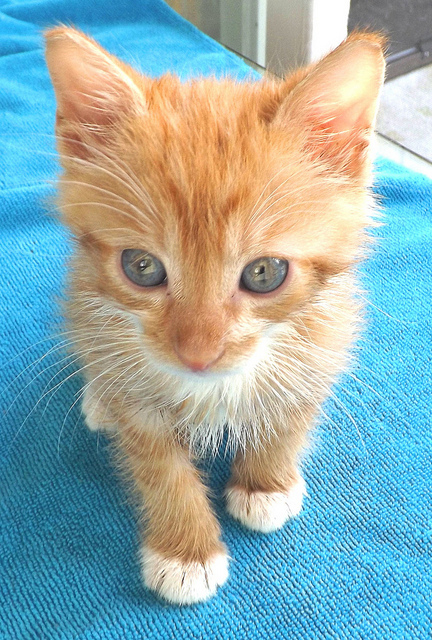 Orlando was a ridiculously handsome little orange tabby with striking eyes of an unusual aquamarine and gold colour blend. 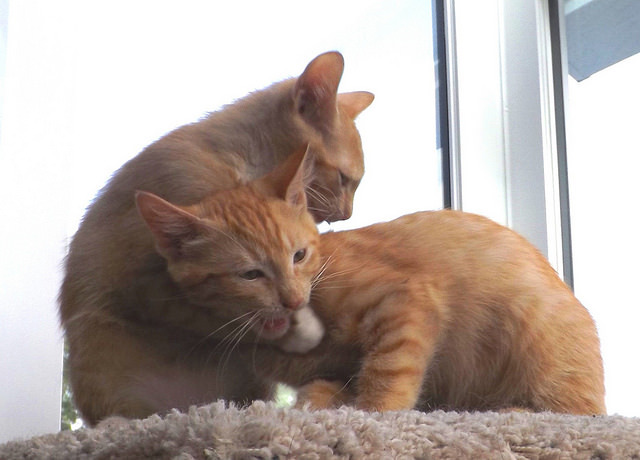 Despite being the lightest and leanest of the kittens, he was the alpha male, though not in a mean, bullying way. He was fearless and the first to explore any new place or situation, and he could be a relentless pest when he wanted to get into something that he shouldn’t. TJ was a gentle, loving, and highly empathic little guy, the sort of cat that will stay by your side, fuss over you, and kiss your nose if he thinks you need emotional support (I came down with a flu while we had these guys, so TJ spent a lot of time in his nurse kitten role). Ginger and white with iridescent golden eyes and a sweet temperament, he was the most cuddly kitten of the bunch and loved to be picked up and held. He spend a lot of time on my lap, and unlike the other kittens, he was always careful to jump from the printer or a nearby chair rather than directly from the ground so that he didn’t accidentally scratch me during his landing (the further the jump, the more likely it is that a kitten will slide around and use its claws to keep from falling because they haven’t yet developed good coordination). The tuxes were adopted by a couple who send us regular updates, photos, and videos of the boys, and the gingers were more recently adopted by a family who have time to give them plenty of attention during the transition because their daughters are home for the summer. VOKRA is still overwhelmed with kittens, so I suspect that we will soon be bringing home a new batch. 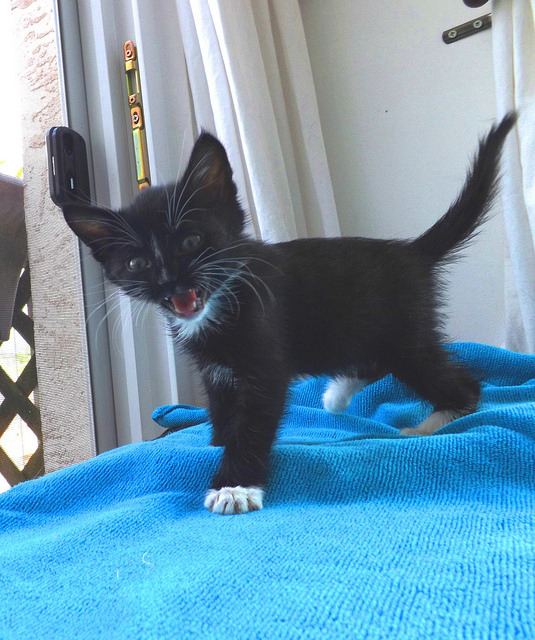 For more foster kitten tales and pictures, see the main Foster Kitten Photo Diary page.